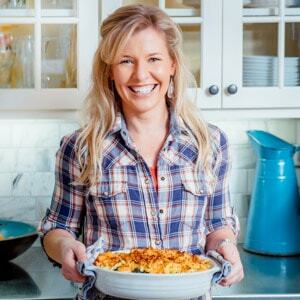 Have you noticed that I am really getting into a groove here with these comfort food makeovers? Today I made Chicken Divan that’s about 100,006 times more healthy with no mayonnaise and a ton of creamy, yummy flavor. 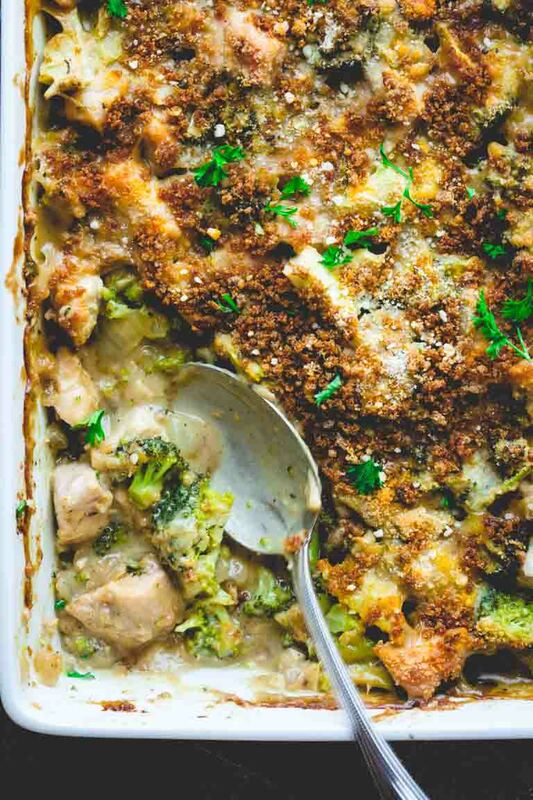 This casserole is made entirely from-scratch with fresh broccoli! You know how when you shop while hungry you buy all sorts of random stuff? Bad idea! Well, how about when you shop somewhere you don’t normally go? That’s equally as bad. This past weekend Jase, the girls and I went to a store we don’t normally shop at. I had a humungous list, with stuff for work, stuff for the school week, stuff for dinner — it was epic. So this was destined to be a long shop. We made it out in about an hour with everything on our list (except inexplicably milk and half and half.) And we also ended up with about a thousand things that weren’t on our list! Part of that is due to the fact that the hubby was along and no matter where we shop, he loves to act like his 8-year-old self and put junk food into the cart while I am not looking. And then pretend he doesn’t know where the Sriracha Wasabi Peas came from. But it was also a super long and noteworthy experience because when you’re not just going through the usual “one of these, two of these. I always buy this thing,” you end up looking around and see a whole world of groceries to discover and try. Which can be cool. But it can also be sad. Because what I also noticed and was struck by was the massive amount of processed food-products in the middle aisles of the grocery store. The packages of noodle bake kits and not real food convenience meals with maltodextrin used to keep the food-product particles in perfect suspension. It was depressing. You know what would cheer us up after all that? What would give us hope? Some comfort food! That’s made entirely from scratch and healthier. Enter: this no-mayo Chicken Divan! Chicken Divan is a broccoli and chicken casserole in creamy gravy that’s enriched with mayonnaise. It’s often made with cream of mushroom soup, whole milk, sour cream and/or mayonnaise, and a good amount of buttery breadcrumbs. It’s the type of dish your mom and grandma likely grew up eating, and you’ve probably eaten it at least once in your life (even if you didn’t realize it at the time!). Traditional chicken divan is crazy yummy, but normally mega high in calories. I had to play around with this healthier formula a bit because I wanted to make it without the added calories of mayonnaise, but I wanted it to seem rich and saucy like traditional Chicken Divan. I decided that I wanted to try to make the chicken and the vegetable sauce in one pot, so I first seared the chicken to brown it, and to increase the flavor of the sauce. Next, I sautéed the garlic and onion in the skillet with the fond from the chicken. Then comes sherry, which always makes recipes taste a million times more comfort foody in my opinion. I thickened the broth with a basic flour slurry. Then finished it with a small yet vital amount of sour cream. (Just a ¼ cup for 6 servings—worth every gram of fat!) Parmesan seals the deal. Oh my gosh you guys! You have to try this healthy chicken divan recipe. It was the broccoli that was an issue. Getting that soft, soaked in gravy texture, without making it yucky soft. That’s where I stumbled. After a couple tries, I ended up finding that if I zapped it in the microwave quickly to soften it ever so slightly it cooked more quickly but didn’t get mushy. 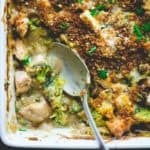 It cooks more in the oven as the breadcrumb topping browns, and the end result is that classic tender broccoli texture everyone knows and loves about chicken divan. This is comfort food my friends. Spoon this over egg noodles and you’ll never glance at another processed meal kit packet again. PS. Folks in the Vermont area, please join me for a book signing at Phoenix Books in Burlington on November 26th! 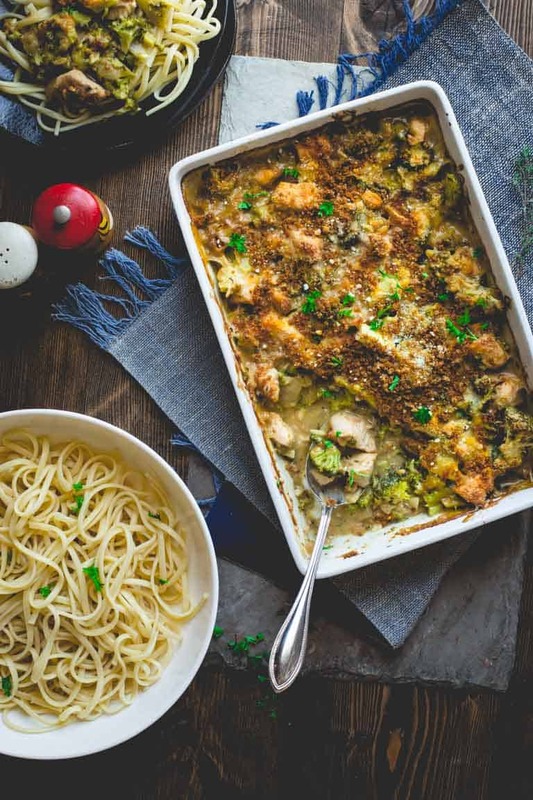 This Chicken Divan is a healthy comfort food make over made with no mayonnaise. 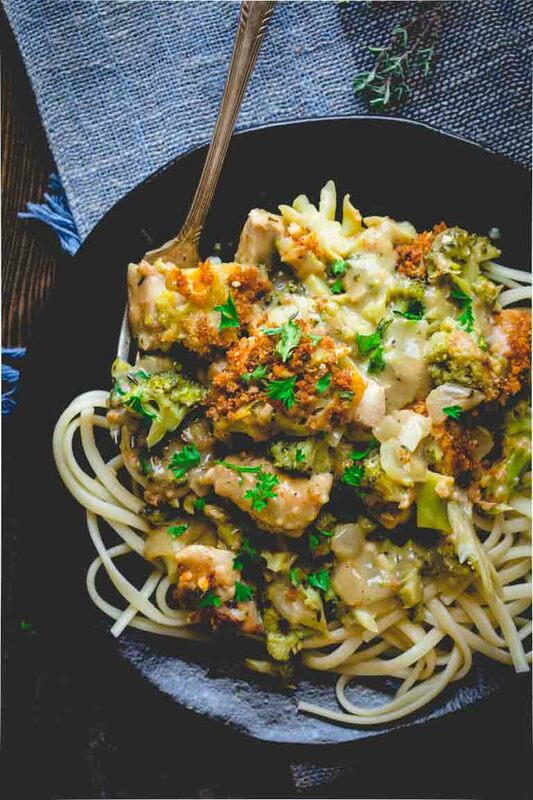 The chicken and tons of broccoli are cooked in a creamy sauce in one pot. Ready in under 1 hour it’s the perfect cozy Winter dinner! Preheat oven to 400ºF. Coat a 2 ½ quart baking dish with cooking spray. Heat 1 tablespoon oil in a large non-stick skillet over medium-high heat. Add chicken and cook, stirring once or twice, until browned on the outside and just cooked through, 7 to 10 minutes. Transfer to a plate and tent with foil. Return the skillet to medium heat and add 2 teaspoons oil. Add onion, garlic, salt, pepper and thyme and cook, stirring often until the onion is softened and starting to brown slightly, 3 to 4 minutes. Add sherry, increase heat to high and simmer, scraping up any browned bits (or until the sherry is almost completely evaporated), 1 to 3 minutes. Stir in 1 ½ cups broth and bring to a simmer, stirring occasionally. Stir the remaining ½ cup broth and flour in a small bowl to make a slurry. Gradually whisk the slurry into the simmering vegetable mixture. Bring to a simmer, stirring constantly. Remove from the heat. Stir in 1/3 cup parmesan and sour cream. Stir in the chicken and any accumulated juices. Meanwhile, place broccoli and ½ cup water in a microwave safe bowl. Cover with a layer of parchment and then a layer of plastic wrap and microwave until the broccoli is bright green, about 2 minutes. Carefully remove cover, drain broccoli. Add the broccoli to the chicken mixture. Mix thoroughly. Transfer the mixture to the prepared baking dish. Top with the remaining 1/3 cup Parmesan. Mix the remaining 1 teaspoon oil with panko and paprika in a small dish. Sprinkle over the casserole. Bake until hot all the way through and the top is golden, 15 to 22 minutes. Thank you for sharing, and so glad you stopped by. Please come back and let us know if you do try this recipe Natalie. Have a great day. You put a lot of work in developing this healthy version of chicken divan. It sounds delicious and so much more healthy then the standard version. Thanks so much Tara. Hope you do, and please let me know if you like it! Oh my gosh, I totally wouldn’t have guessed this was healthy from looking at it!! It looks utterly divine; I’ll definitely be making this some time after Christmas when we have over indulged! Ha ha, love the idea of this fooling the eye. Have a great holiday season Annie and let me know if you do try it. What a wonderful dinner for winter. I love chicken divan but follow the mayo addition in recipes. This dish sounds healthier and just as delicious. Love how you keep the broccoli from turning into mush. Yum. Thank you so much Ali and I’m glad you stopped by. That’s awesome Claudia! Thank you so much, and please let me know if you try it. I saw this on your Instagram and went YUM!!! Gonna try it very soon with gluten free ingridents. It’ll be perfect for a cold day. I must add that I’ve had a very similar shopping experience recently. I usually shop at Whole Foods and once in a while at Nob Hill (Raleys) and one time I was making a “test cake” that was only gonna get tasted by one person then given away if anyone wanted it. I decided to just use conventional ingridents instead of what I usually buy. Going to Nob Hill and looking in the middle isles was like getting lost in a maze of products. Organic = 2-3 options, while conventional = 10+ Options with low fat, no fat, calcium added, sugar free, omega 3, 2% 1% and a hundred of other options. My shopping took so much more longer because all I wanted was a simple product. It took me 8 minutes to find plain peanut butter with no fixings, and even after I paid and got home, I realized I picked up a “1/3 sugar less” peanut butter. Jeez! Yes the reading of labels! Takes for ever, and then getting the wrong thing by mistake. That’s the worst. I came home with Jasmine tea by mistake recently because it looked so much like the rooibos I normally buy. I was so mad at myself. Ha ha. What the heck is 1/3 less sugar peanut butter anyway? Shouldn’t all peanut butter be sugar free? Ha ha. Thanks so much for coming by Auzeen. Hope you have a great day. OMG….just watching a show of TV, where they are serving Chicken Divan…I remember eating this as a kid all the time, and I always loved it, so of course when it came up on TV, I got a craving, so I googled recipes, and got all the typical mayonaise recipes….and then i found yours. I AM DEFINITELY making this recipe…..it sounds so good, my mouth is watering. I will post another comment with a picture if possible of my attempt. Thank you….This sounds delicious! My husband and I loved this dish and didn’t miss the mayo at all. This was still rich and satisfying and I’ll certainly make it over and over. Thanks for the recipe!!! I am so glad to hear it. Thank you for coming back with your feedback. I really appreciate that! I made this for my family tonight and we loved it! Super delicious and I absolutely love that it doesn’t contain “cream of something” soup! This also works well with Weight Watchers. I calculated it at 8 Smart Points per serving. You are so awesome for coming back to report! I really appreciate that. And also thank you for the information about the WW points. I know other readers will find that useful! I made this tonight. It was delicious. Thank you. I plugged this into recipe creator on WW’s website for the Freestyle points and I’m so excited to say if using fat free sour cream, 1 serving is only 4 Freestyle points. Eeeeeee!!!! I’m so excited to make this for the week! That’s great to hear! Hope you enjoy it Stephanie. I love how you lightened up this classic (and favorite) chicken casserole! Delish! I haven’t had chicken divan in years! 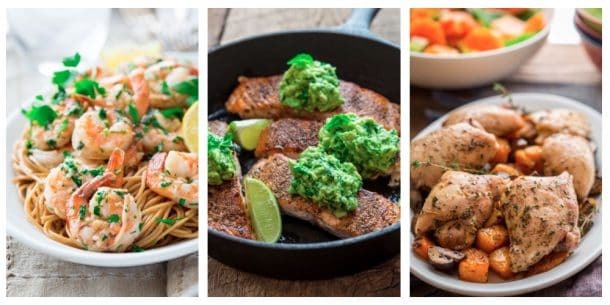 I used to eat lots of recipes like this but since getting married and having the kids, I have to tend to ingredients that my family does like – which unfortunately includes pretty much no greens… it’s a work in progress! Putting it on the menu – nothing wrong with broadening their horizons. Made this tonight and it was amazing! Sad thing is there was none left for me to take for lunch tomorrow. Ha ha! Well that is a great review Beth. I’d say that’s a success. My girls are both growing so much these days I have been struggling to make enough for lunches too. I have not tried doubling this Chicken Divan, and using a large casserole dish. My guess is that it would be totally fine. Let me know if you try it.